I’ve used SketchUp. Sadly it’s crap at this kind of complex shape. Thankfully, I work with a bunch of people who can run Solidworks and and Alias in their sleep. My boss is a veteran industrial designer and as soon as we’re a little less swamped, he’s going to model it for me in CAD and help me refine a final shape. I can’t wait! I was scrolling through the Exterior Design section trying to get a feel for progress of the model when I realized that not only have you skipped a couple models (C and D), unless Nate’s counts as one of those, but that you’re mixing your Greek and Radio Alphabet as well. So what do you say? Any chance of getting a gallery that shows the evolution of the design? And what will it be? Alpha, Beta, Gamma, Delta, Epsilon… or Alpha, Bravo, Charlie, Delta, Echo? Personally I like the radio alphabet better. Just think, your next model would be either Zeta, or Foxtrot. Yeah, I know. I’m mixing my alphabets. So sue me. What’s interesting to me is that few of these ideas are really iterations of each other. Sure, they’ve gotten a bit more refined as they go, but most are wholly separate ideas. I can’t wait to model this one for real in foam. Don’t know about anyone else, but personally I’d love to see some detail pics of that process. How to go from a block of foam to a 3D model. Where you got the foam, what kind of tools you use, how different stages are handled. I’m sure a big piece of it just relies on having an artistic eye. That’s a great idea. I figured I’d take photos of the end thing, but documenting the whole process would be fun. The gist of it is that the understructure will just be 1/4″ birch ply, dowel and a bit of hardware. The foam I use is just floral foam — the kind they stick artificial flowers in. It’s really grainy and you can basically sand it down with your fingertips. It’s fragile, but easy to work and most importantly, it’s CHEAP! The industry standard industrial design sculpting foam is called Balsa Foam, and it’s really expensive. A square foot an inch thick is $15-$20. But the floral foam bricks (about the size of a masonry bricks), are $3 for six. The finishing process is a bit tougher. It involves about a billion layers of automotive primer, some wet sanding, and a layer of epoxy. Then more sanding. The tricky part is just how fragile the whole thing is until it gets a decent skin of plastic on it. I’ll document as much of the process as I can. I can do time lapse on my iPhone, which is pretty fun. It would not be hard to model in sketchup – I would start by making it not too fine grain, simply working over your profile drawing. Solidworks is fine, if you can use it, but nothing is crappier than a tool you can’t use yourself. Yeah, the plan is for me to learn more and more CAD as part of my job. Hasn’t happened yet, though. In the meantime I’m just working with the tools I’ve got. It sure would be nice if I could import shapes into SketchUp from Illustrator. Illustrator has some super basic 3D rendering capability, but it’s not particularly helpful for this kind of thing. Then again, the SR-71 was built without calculators, let alone CAD. I don’t need CAD to do this. There’s been plenty of precise engineering work done over the years off of drawings, and I can easily do those. If anything, I probably need to go the other way and get completely out of the computer — go back to basics with pencil, tracing paper and ink. I think you should add wheel covers to the front wheel pods. Make them removable for tire changes & brake service, etc., or just make the whole pods removable and fully enclose the wheels. My 2 cents. In terms of aesthetics, I’m with you. I’d love to close the wheel fairings. 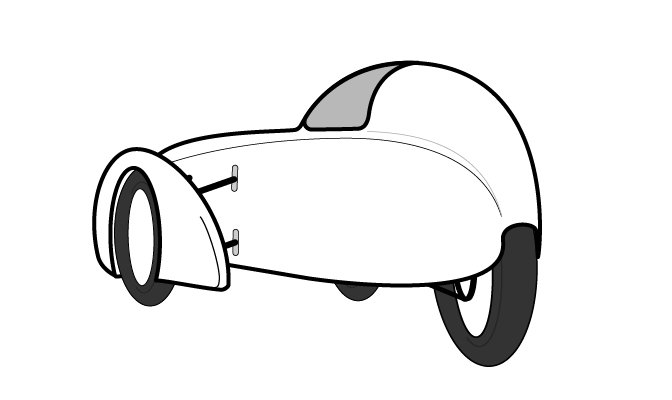 What you probably hadn’t realized is that the wheel fairings don’t turn with the wheels. They tilt with the wheels and chassis, but they don’t turn with the wheels. The reason for this is two fold. First, if they did turn, they’d have to be pretty short so that they didn’t hit the body. Second, if they did turn with the wheels, then gusty side winds could actually induce unwanted steering input, leaning, and other bad things. So it made more sense to leave them open, allow the wheels to turn inside them, but keep them attached to the tilting mechanism. 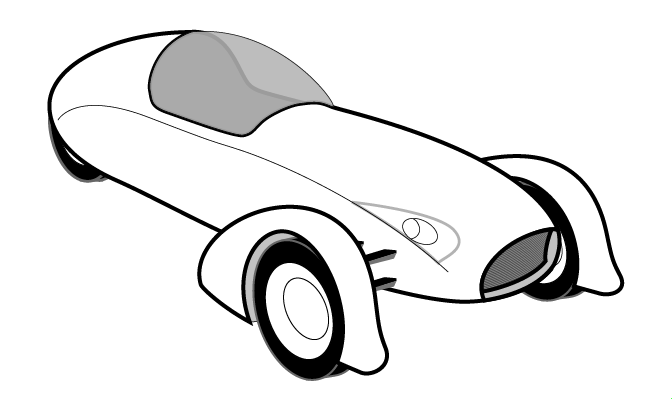 I like how the shape is progressing, but personally would prefer the headlights to look more “old school” instead of modern (like glass covered Jaguar XKE, maybe in the front wheel farings).